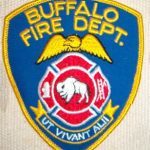 Buffalo Firefighters responded on 3/16/17 at 1205 Hrs for a report of a structure fire on from a car into the gas meter on Ruhland Ave.
Engine 31 went on location with fire on the #4 side of a 1 1/2 story house extending into the structure. Ladder 14 reported fire on the 2nd floor & Rescue 1 reported heavy fire conditions. B-56 requested an additional Engine to the scene and reported the fire being fed by the natural gas. B-56 further requested an additional 1 & 1 to the scene. The fire was placed under control in 70 minutes.